(Thanks to guest writer Victor Hugo, who having haunted these pages in many a post kindly permits us to republish the open letter he wrote on February 11, 1854 to Home Secretary (and future Prime Minister) Lord Palmerston. This is the English version as published by London’s Daily News on February 17 of that year; here is a French version of the same. Hugo at the time was living as an exile from the French Empire in the British-controlled Channel Island of Jersey; the case concerned was the highly controversial hanging of John Tapner on the nearby island of Guernsey for the murder of an aged Frenchwoman. Nobody ever hanged again on Guernsey after this possible wrongful execution. Fifteen years ago Caliot, a murderer, was condemned to death, and pardoned. Eight years ago Thomas Nicolle, a murderer, was condemned to death, and pardoned. Three years ago, in 1851, Jacques Fouquet, a murderer, was condemned to death, and pardoned. * In each of these cases the penalty of death was commuted for transportation. In each case, to obtain a commutation of the sentence, a petition signed by the inhabitants of the island was sufficient. In 1851 transportation was thought a sufficient punishment for Edward Carlton, who murdered his wife under circumstances of the most horrible description. All this has taken place within fifteen years in the island from which I now address you. Let us shift the scene from Jersey to Guernsey. Tapner, a murderer, an incendiary, and a robber, is condemned to death. At present, and the facts above stated prove the truth of the assertion, the penalty of death is virtually abolished in the opinion of every sane, well thinking man. No sooner is Tapner condemned than a cry is heard, petitions are multiplied; one, energetically establishing itself on the principle of the inviolability of human life, was signed by 600 of the most enlightened of the inhabitants of the island. And it is worthy of notice that not one minister of any Christian sect has deigned to affix his signature to either of these petitions. These men are probably ignorant that the cross is a gallows. — The people cried: “Mercy!” The priest cried: “Death!” — Let us pity the priest and resume our subject. These petitions have been forwarded to you — a repsite has been granted. In similar cases a respite was equal to a commutation of the sentence — the island draws breath — the gallows is not to be erected — cruel error! the gallows is erected — Tapner is hung! and this after mature consideration. Why should Guernsey be refused that which has been so often granted to Jersey? Why deal to one concession and to the other affront? — Why should pardon be sent here and the executioner there? Why this difference where all things else are equal? — What use was the respite but to aggravate the torture? — Was some mystery involved? To what purpose has been consideration? Things are whispered, sir, to which I dare not listen. No! it cannot be true. What! a voice, and that of the most obscure, if it be the voice of an exile, cannot ask pardon from an insignificant corner of Europe for a man about to die without being heard by M. Bonaparte, without M. Bonaparte’s interference. What, M. Bonaparte, who has the guillotine of Bellay, the guillotine of Draguignan and the guillotine of Montpellier, not satisfied with all these! Has he still an appetite left for a gallows in Guernsey. What — in such a case could you have refused justice to the proscribed for fear of giving umbrage to the proscriber. If so, the man was hung to accommodate, and the gallows erected as an act of courtesy, and could you have done all this to strengthen your alliance. No, no; I do not, I cannot believe it. I cannot even admit the idea, although I shudder at it. Before the great and generous English nation can your Queen have the right of pardon, and M. Bonaparte that of a veto. At the same time that there is an omnipotent in heaven, can there be an omnipotent on earth? No. I merely say that it was not possible for the French journals to speak of Tapner. I state the fact, but I draw no conclusion from it. However this may be, you have determined to use the terms of the despatch, that justice should take its course, and all is over. However this may be, Tapner, after having been three times respited, and had his case three times under consideration, was hung yesterday, the 10th of February, and if there be any truth in the conjectures, which for myself I utterly reject, I present you, sir, with the bulletin of the day. you may, if such be the case, transmit it to the Tuileries. These details cannot be offensive to the Empire of the 2nd of December. The Eagle will hover with delight over the field of this victory! He is a gallows Eagle! A garden joined the prison. In this garden the scaffold was erected. A breach was made in the wall for the prisoner to pass through. At 8 o’clock in the morning the neighbouring streets were crowded with spectators, of whom 200 of the privileged were admitted into the garden. The man appeared in the breach. He walked erect and with a firm step; he was pale, the red circle caused by anxious wakefulness surrounded his eyes. The month just passed had added twenty years to his age — a man thirty years of age appeared fifty. He walked partly round the garden, in a walk gravelled expressly for the occasion. The javelin men, the sheriff, the under-sheriff, and the Queen’s solicitor surrounded him. His hands were tied loosely, as we shall presently see. According to English custom, while the hands were crossed upon the breast, a cord bound the elbows behind the back. Behind him, the chaplains, who had refused to sign the petition for mercy, followed weeping. The gravel walk led to the ladder — the cord was swinging — Tapner ascended the ladder — the executioner trembled: inferior executioners are at times susceptible of pity. Tapner placed himself under the noose, and pressed it over his head, and his hands not being firmly tied, he desired the executioner, who seemed quite confused, to arrange the rope. Then, “as if he had had a presentiment of what was to follow,” says the same eye-witness, “he said, ‘Tie my hands tighter.’ ‘That is unnecessary,’ replied the executioner.” Tapner standing thus with the rope round his neck, and his feet on the trap, the executioner drew the night-cap over his eyes, and nothing more could be seen of that pale face but the mouth moving as in prayer. After some moments, the man destined to this high office pressed a spring — the drop fell, and the body fell abruptly through — the cord tightened, the body turned, and the man was considered dead. “It was thought (says the eye-witness) that Tapner was killed at once by the rupture of the spinal marrow, he having fallen 4 feet,” but the witness further adds, “the relief of our oppressed hearts did not last two minutes.” Suddenly the man not yet a corpse, but already a spectre, moved. The legs were thrown convulsively about, as if seeking some stay in the empty space; what could be discovered of the face was horribly disfigured; and the hands, which had become loose, were clasped and relaxed, as if to implore assistance. The cord around the elbows had snapped in the fall. Amidst these convulsions the rope began to swing, the elbows of the poor wretch came in contact with the edge of the trap, he clung to it with his hands, rested his right knee upon it, raised his body, and seemed to lean towards the crowd. Again he fell; and twice, says the eye witness, was the same scene repeated. He then raised his cap, and the crowd gained a sight of his face. This, it seemed, was too much. It was necessary to close the scene. The executioner reascended the scaffold, and caused the sufferer (I still quote the eyewitness) to let go his hold. The executioner and the victim struggled for a moment; the executioner triumphed. Then this wretch, himself like one condemned, threw himself into the aperture where Tapner was hanging, straightened his knees, and hung to his feet. The rope oscillated for a moment, bearing the victim and the executioner, the crime and the law. At last the executioner himself relaxed his hold; all was over; the man was dead. 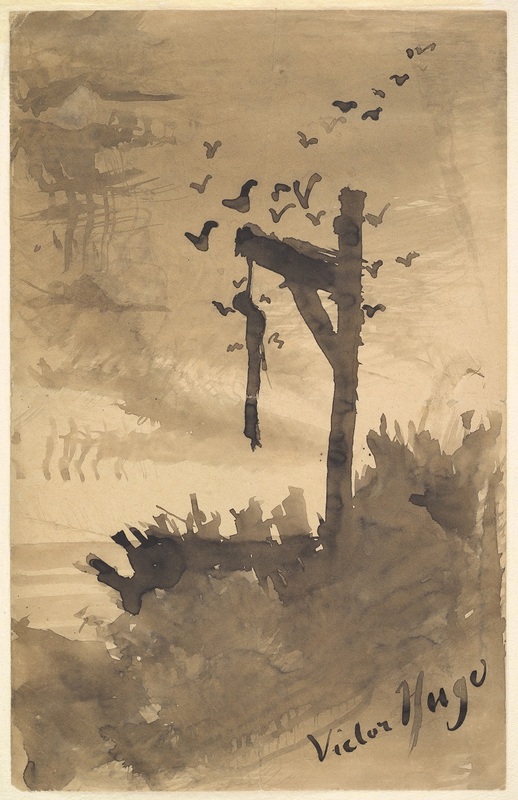 Also a prolific drawer, Victor Hugo produced this Ecce in 1854, and several other depictions of the gallows in the ensuing years — possibly inspired by his horror at Tapner’s fate. Ecce is also known as John Brown, although that American slavery abolitionist was not executed until 1859. You see, sir, how things were managed; the effect was completed; for the town, being built as an amphitheatre, everything was seen from the windows, all eyes were fixed on the garden. If it were the object to excite a feeling of horror, it was done: the crowd cried “Shame, shame,” and several females fainted. During this time, Fouquet, who had been pardoned in 1851, is repeating. The executioner has converted Tapner into a corpse; Mercy, Fouquet into a man! Between the time when Tapner fell into the trap, and that in which the executioner, no longer perceiving any motion, let go his feet, 12 minutes elapsed. Twelve minutes! Let that time be calculated, if any one knows by what clock to number the moments of suffering. Such, sir, was the mode of Tapner’s death. The theory of example is satisfied; the philosopher alone mourns, and asks himself if this be what is called allowing justice to take its course? We must believe the philosopher to be wrong. The punishment has been frightful, but the crime was hideous. Must not society be defended? What will become of us if, &c. &c. The audacity of criminals would meet with no restraint. There would be nothing but atrocities and murders. A check is absolutely necessary. At least, it seems your opinion, Sir, that Tapners should be hung unless they be emperors. Let the will of statesmen be done! Theorists, dreamers, those visionary spirits who have formed some notion of good and evil, cannot sound, without difficulty, certain depths of the problem of destiny. Had Tapner, instead of killing one woman, destroyed 300, adding to the heap some hundreds of old men and children — had he instead of breaking a door, violated an oath — had he, instead of purloining a few shillings, stolen 25 millions — had he, instead of burning the house Saujon, overawed Paris by force of arms, he would have an ambassador at London. It might, however, be as well to define a little more precisely the point at which Tapner ceases to be a robber, and Schinderhannes commences politician. Sir, this is horrible! We are members, you and I, of the infinitely small. I am only a refugee, you are only a minister — I am ashes, you are dust — Atom may surely speak freely to atom — where each is nothing, truth may be spoken. Well then, be assured, whatever may be the actual success of your policy, however glorious the alliance of M. Bonaparte, however honourable it may be for you to act in strict union with him, however far famed and magnificently may be your common triumph in Turkish affairs, this rope, which was fastened round a human sack, the trap which opened under his feet, the hope that, in falling, he would break his spine, the face become livid beneath the deep shadow of the gallows, the bloodshot eyes bursting from their sockets, the tongue lolling from the throat, that groan of anguish only stifled by the knot, the terrified soul which still clings to its tenement, the convulsed knees which seek some support, those bound hands mutely clasped and asking help — and that other man, that man of darkness, who throws himself upon these last struggles, who clings to the knees of the dying wretch, and himself hangs upon the hanging — Sir, these things are frightful! Victor Hugo, The Hanged Man, c. 1855-1860. And if haply the conjectures which I disavow be true, if the man who hung to the feet of Tapner were indeed M. Bonaparte, it would be monstrous. But, I repeat, I do not believe this. You have yielded to no influence; you simply said — let justice take its course; you gave this order, as you would have done any other, the prolonged discussions concerning capital punishment do not interest you. To hang a man, and to drink a glass of water are the same things in your estimation — you did not comprehend the importance of the act; it was the oversight of a statesman, nothing more. Sir, keep your blinders for earth, and do not offer them to eternity! Do not trifle with such deep interests, mix nothing of your own with them; it would be impudent. I can see more deeply into those interests than you — Beware! Exul sicul mortuus. I speak as from the tomb. Bah! what matters it? 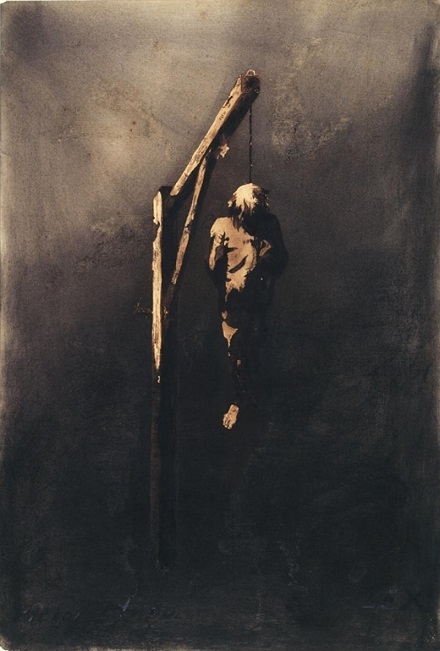 A man is hung; and what more? a coil of rope to be wound up; some timber work to be taken to pieces a corpse to be buried. Certainly these are great matters! We will fire the cannon, a little smoke in the East, and all will be over. A microscope will be required to detect Guernsey and Tapner. Gentlemen, this rope, this beam, this corpse, this dreadful though invisible gallows, this suffering, carry us into immensity. They involve the social question, which is more important than the political; they do more — they carry us beyond earth. That, which is of little consequence, is your cannon, your politics, and your smoke. The assassin who to-morrow becomes the victim, as a soul which takes its flight holding the end of the gallows-rope — it is this which is frightful. Statesmen, who between two protocols, two dinners, and two smiles, carelessly press with white-gloved hand the spring of the gibbet, and the trap falls under the feet of the victim. Know you what you do? The infinite appears; the unfathomable and the unknown; the mighty shade which rises suddenly and terribly beneath your littleness. Proceed! Let us observe the men of the old world at their work. Since the past still struggles let us examine it. Let us observe its successive phases. At Tunis it is impaling; with the Czar the knout; with the Pope it is the garrot; in France the guillotine; in England the gallows; in Asia and America the slave market. All this will be swept away. We, the anarchists, the demagogues, the blood-drinkers, tell you, the protectors and saviours of the world, that human liberty is to be respected, human intelligence is holy, human life is sacred, and the human soul divine. Now go on hanging! But beware! The future opens. You think that living which is dead, and that dead which is living. The ancient form of society, but it is dead. You are deceived. You have stretched out your hand to the spectre of darkness, and chosen her for your bride. You turn your back upon life: it will soon arise behind you. When we pronounce the words Progress, Revolution, Liberty, Humanity, you smile, unhappy man, and point to the darkness in which we both are involved. Do you indeed know what that night is? Learn the truth; ere long the ideas will burst forth in all their strength and glory. Democracy yesterday took the name of France; to-morrow it will take that of Europe. The eclipse does but conceal the increasing magnitude of the star. James Fouquet — We are informed that James Fouquet, condemned to death by our Royal Court, for the murder of Derbyshire, and whose punishment was commuted by her Majesty into transportation for life, was removed, about six months ago, from the prison at Milbank, where he had hitherto remained, to Dartmoor. He is nearly cured of the wound in his neck, and his conduct has been such, while at Millbank, that the governor of that prison thinks it extremely possible, there will be a further commutation of his sentence into banishment from the English territories.